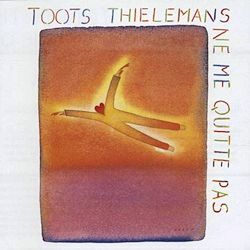 I'm not sure whether this release is in direct response to the death of Toots Thielemans, who died on 22 August last year at the age of 94. The album has had several incarnations over the years, including an appearance under its English title "Do Not Leave Me". Neither am I certain why this latest reissue, targeted towards a French market, is short on information re. concert date, venue and participating personnel. After some research I discovered that this live concert was recorded on home turf at the Palais des Beaux Arts, Brussels on June 19th, 1986, with Thielemans in collaboration with Fred Hersch (piano), Marc Johnson (bass) and Joey Baron (drums). The title number Ne me quitte pas or Do not leave me is cast in a melancholic vein, conveying late-night loneliness. Thieleman's expressive line evokes sensations of sorrow, regret and wistfulness, acutely responsive to Fred Hersch’s sensitive accompaniment. Although it fails to mention it on this reissue, Blue 'Green is tracked withAll Blues, hence the twenty minute length; the two segue into one. Blue 'Green sounds quite improvisatory, with the music evincing a sense of evolving on the wing. All Blues, with its more rhythmically-charged narrative, provides suitable contrast. Stardust, a tune most will be familiar with, has a world-weary flavour. Once again, Thieleman and Hersch have a tangible affinity between them, and their expressive rubato is astonishing; no wonder the audience sound so enthusiastic. Autumn leaves contains a stunningly virtuosic drum improvisation from Joey Baron. Thieleman's versatility as a musician is evident in the final two tracks. In Velas he trades his harmonica for a guitar proving, on yet another instrument, he's a natural. In Bluesette, his best-known composition, he whistles the melody, and very skilled he is too at achieving purity of tone and sharply-focussed intonation. The live recording may be thirty years old now, but it sounds terrific. Microphone placement, acoustics and balance all tick the right boxes, with the music emerging as clear and fresh as the day it was taped. It stands as a wonderful tribute to a great musician.